THE PHILIPPINES' LEADING CREATIVE PROCESS OUTSOURCING COMPANY SUPPORTING CLIENTS IN THE US, UK, AUSTRALIA & MANY OTHER COUNTRIES. 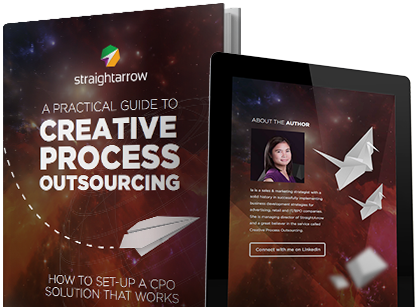 StraightArrow is the pioneer of creative process outsourcing in the Philippines. We provide efficient, reliable and scalable creative and marketing support to digital agencies and creative teams around the world. Over the past seven years, we’ve tested and refined our approach, learning from our partnerships with HubSpot, Google, and the IBPAP, and from our collaboration with clients. We take pride in supporting industry leaders like Sprinklr, iProspect, Reed Business Information and LexisNexis UK. We bring together award-winning creativity, technological capability, information security and operational systems and processes that translate our clients’ strategies and ideas into campaigns,marketing collateral and other creative work. At StraightArrow, we showcase the skill and creativity of Filipinos. We create for the world. "I recommend StraightArrow often and with confidence that the quality of service they will provide will be excellent." "Interest in StraightArrow and their capabilities has grown not only across RBI but across RELX too. There are 2 dedicated people supporting Global Production, the Creative Factory is used extensively throughout our global marketing team supporting creative design and execution, and LNUK has 22 dedicated team members supporting their marketing team in London. Discovering StraightArrow has meant my team’s output has increased significantly, allowing us to fl ex our resources as and when needed and enabling us to support global scalability." "I am very happy overall with the teamwork. We have got very good feedback from the client, as well, which is amazing!" "The StraightArrow team is dedicated, efficient, patient, and reliable. They turn dreams and concepts into wireframes and web platforms that improve day-to-day life, and into business models for business owners. I would recommend them every time." "StraightArrow listens. Because of this, they are able to offer the best solutions to marketing and creative problems. They are also punctual in delivery. I love everything about them!" "Can I just say THEY ARE AMAZING, and they DESERVE THE HIGHEST POINTS!!!"